Senator Edward Kennedy’s passing does not provide justification for passage of an imprudent health-care bill. 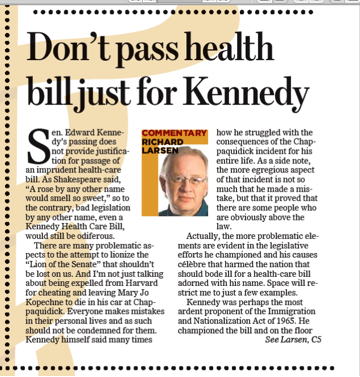 As Shakespeare said, “A rose by any other name would smell so sweet,” so to the contrary, bad legislation by any other name, even a Kennedy Health Care Bill, would still be odiferous. There are many problematic aspects to the attempt to lionize the “Lion of the Senate” that shouldn’t be lost on us. And I’m not just talking about being expelled from Harvard for cheating and leaving Mary Jo Kopechne to die in his car at Chappaquidick. Everyone makes mistakes in their personal lives and as such should not be condemned for them. Kennedy himself said many times how he struggled with the consequences of the Chappaquidick incident for his entire life. As a side note, the more egregious aspect of that incident is not so much that he made a mistake, but that it proved that there are some people who are obviously above the law. Actually, the more problematic elements are evident in the legislative efforts he championed and his causes célèbre that harmed the nation that should bode ill for a health-care bill adorned with his name. Space will restrict me to just a few examples. Kennedy was perhaps the most ardent proponent of the Immigration and Nationalization Act of 1965. He championed the bill and on the floor of the Senate declared, “First, our cities will not be flooded with a million immigrants annually. Under the proposed bill, the present level of immigration remains substantially the same…. Secondly, the ethnic mix of this country will not be upset…. Contrary to the charges in some quarters, [the bill] will not inundate America with immigrants from any one country or area, or the most populated and deprived nations…. In the final analysis, the ethnic pattern of immigration under the proposed measure is not expected to change as sharply as the critics seem to think…. The bill will not flood our cities with immigrants. It will not upset the ethnic mix of our society. It will not relax the standards of admission. It will not cause American workers to lose their jobs.” He could not have been more wrong as much of our illegal alien problem is directly attributable to that Act. Everything he promised wouldn’t happen, did. Related to health-care reform, we shouldn’t forget that much of the current health-care conundrum was created by the Senator. His 1973 legislation created HMOs and PPOs and created the “tangled intersection of the public and the private,” according to National Review. Interestingly, he later denounced his creation. There was also his effort to undermine Ronald Reagan on the strategic defense initiative that arguably was the final nail in the coffin of the Soviet Union. Among the documents released to the public after the fall of the USSR were KGB files documenting how Kennedy sought a means with Soviet Premier Yuri Andropov to manipulate public opinion against Reagan’s proposed nuclear deterrent. Political opposition is one thing, but an act like that borders on treason as it deals directly with national security. Kennedy was an affable man who left his mark. But too many of his marks were wrong for the country. While some of the critical denunciations of the current health-care proposals may be questionable, the bills’ wording obviously leaves them open to less than idyllic interpretations. This makes them bad bills and leaves the door open to faulty execution on something critical to all of us and provides no solace that health-care decisions will be made in our best interest as opposed to the state’s interest. 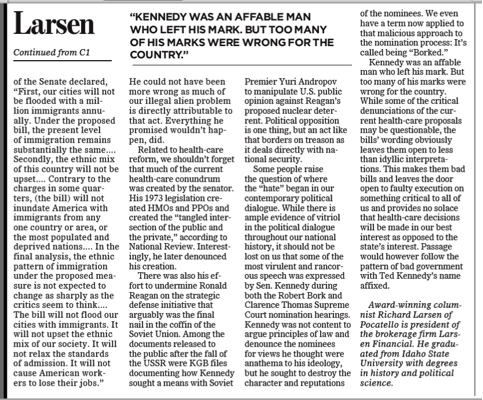 Passage would however follow the pattern of bad government with Ted Kennedy’s name affixed.